Quick reminder: Lois and the entire Daily Planet building were whisked away from Earth several issues ago, then shrunk and placed in a bottle on Brainiac's ship. Superman dreams that he's flying through space with Lois in a space suit. They share a wonderful romantic moment until her face swells up and her visor breaks. Clark wakes up in bed and wishes he knew where Brainiac took her. But he expects that Lex Luthor must be involved. He flies to Luthor's office at the top of Lexcorp Tower and assaults the guards who fire at him. Mercy Graves approaches to tell him about the damages he has caused, which are in the hundreds of millions of dollars. When Superman asks where Lex is, she says she hasn't seen him in at least a week and he could be anywhere. Superman makes one last threat by using his heat vision just inches over her head and leaving his Superman "S" symbol burned into the wall. All the while, Luthor and Brainiac watch on a screen in Brainiac's ship. Lex marvels that he's seen Superman take on entire armies bent on genocide and changed the course of mighty rivers, but he has never seen him THIS upset. Brainiac says that he needs Superman alive for his plan to be complete, but Lex corrects him that he just needs a Kryptonian. Any Kryptonian. Back in Metropolis, Supergirl evades bolts of electricity from Livewire, but eventually takes a hit to the back. Livewire says she's being paid millions to take down Supergirl, but just when Supergirl has been disabled, Brainiac no longer needs Livewire and uses his exobytes to dissolve her where she stands. Later, Supergirl meets up with what's left of the Justice League and explains to Superman that he heard Brainiac's voice on the other end of Livewire's communication, but not Luthor. Green Lantern uses his ring to send out a message to other League members so that if they see anything from Brainiac, Luthor or the exobytes that they contact him immediately. Just then, Batman contacts Superman from his cave and says that Brainiac has just freed the inmates at Arkham Asylum and he could use some help. They arrive quickly and fight Batman's villains while trying to ascertain more information, but none of them seem to know anything except that Brainiac had to do with their release. Unexpectedly, Luthor contacts Superman over his communicator and asks for help. He says he was working with Brainiac, but that he's not any more. He has escaped with the bottle containing the shrunken Daily Planet, but the robots are chasing him and he needs assistance immediately. Superman takes off, but the League warns that Brainiac is releasing tons of meta-human villains all over the world. Superman ignores it because he knows Lois is in the bottle with the Daily Planet. Superman arrives at Luthor's location and quickly takes out all the robots. He turns to Luthor and threateningly demands the bottle. Mercy walks up with it and Luthor pulls out an enlarger that he says he stole as well. While Superman watches the Daily Planet grow back to normal size, a special exobyte sneaks up behind him and bites into his neck. Before he can take a moment to think about it, the occupants of the building flood out of the front doors and Superman is finally reunited with Jimmy Olsen and Lois Lane. But before he can spend more than a few seconds with them, Batman contacts him and says they need him NOW! Batman chews Superman out for leaving. He says that Lois and the Daily Planet were not in any immediate danger and now the Martian Manhunter has been hurt even worse. All the powers he had left have been drained by the exobytes. Batman says, "You need to decide what's more important. Saving your friends or saving the world." Story - 2: Even though Superman acts in character from what we, the readers, should expect of him at this point, there are a few problems with the storytelling. Yes, Superman is upset that Lois is missing and he even leaves a more important battle because he wants to save her life. But Batman's claim that Lois wasn't in any danger was false. He said that the Daily Planet building was perfectly safe in the bottle on Brainiac's ship until they had a chance to deal with the more immediate matters. But Superman didn't remove the bottle. Luthor supposedly took it and was being chased by Brainiac's robots. For all Superman knew, the bottle could have been smashed in that time. It's not that Superman should have left the bigger battle, but Batman's claims aren't correct either. Also, why would Superman presume that Luthor would be at Lexcorp Tower one week after he saw him lose all his limbs and get impaled multiple times through his torso, as we saw at the start of last issue. I suppose he could be distraught, but I don't like having to think through weak excuses to explain odd behavior in a story. 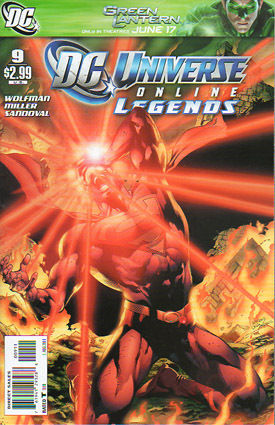 We saw in the opening video to the game that at some point, Superman exiled himself into space somewhere near the Sun, and when he came back to fight Luthor, he was not a happy camper. Presumably something has to happen to Lois Lane at some time in this story, and I really like that I was thrown for a loop and that she survived this first attack. Art - 5: The art is the best part of the book this time. The effects are brilliant, especially when Lois's head explodes and when Livewire hits Supergirl with the lightning bolt. Superman has had a stubbly beard before, but this one looks almost real. Character faces look great up close and at a medium distance, which has not always been the case with this title. Cover Art - 2: I don't even know what to say about this cover. There's nothing about it that makes me feel a need to read it if I saw it on a shelf. It doesn't pertain to the story in the issue and the monotone red takes away from art that would otherwise look decent. Add the Green Lantern movie advertisement to the top and I think it just looks like a Christmas issue.